Travel House Lekki is a 3-Star hotel which offers guests good facilities and associated services for their business and leisure needs. Travel House Lekki hotel is located on KM 14, Lekki-Epe Expressway, Lagos. It shares the same concept and standards as other worldwide respected budget hotels and it's in proximity to the Victoria Garden City. Travel House Lekki has single rooms with en suite bathrooms. 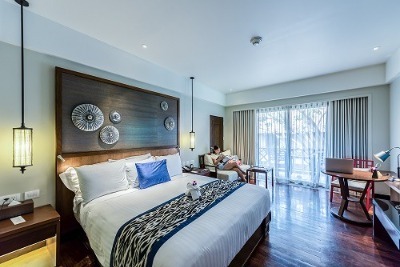 Each of the rooms features an air-conditioner, TV set with a minimum of 3 satellite channels, double bed, writing desk, desk chair, telephone connection to reception, shower unit, toilet unit, and a restaurant menu. All guests are entitled to complimentary morning tea/coffee and/or cold drinking water. A number of facilities are available at Travel House Lekki, these include: Free Internet WI-FI, a restaurant and 24 hours security including overnight mobile police, 24 hours power generation capacity, and a water treatment plant. The hotel offers additional services on requests: A 20-seater Conference Room available for small meetings or training sessions at an extra cost, food and beverage establishments, laundry services and taxi services are also available. Cancellation: Unpaid reservations are cancelled by 7 pm on day of arrival. Paid reservations will only be refunded if cancelled before 7 pm on day of arrival. For groups of 10 rooms or more, unpaid reservations will be cancelled and paid reservations refunded if received in writing by 12 noon, but must be 1 day prior to the day of arrival. Q: Does Travel House Lekki offer free Wi-Fi? A: Travel House Lekki offers free Wi-Fi to all checked in guests. Q: Does Travel House Lekki have a swimming pool? Q: Does Travel House Lekki offer complimentary breakfast? A: No, but guests are entitled to complimentary morning tea/coffee. Q: Is there a fitness centre/gym at Travel House Lekki? A: No, there is no fitness centre/ gym at the hotel. Q: Does Travel House Lekki have a restaurant? A: A restaurant is available at Travel House Lekki. Travel House Lekki is a budget hotel in Lekki, Lagos. The location of this hotel was perfect and the environment was very neat and conducive. The staff were very cordial and the food they served tasted great. The room is very nice and well decorated to suit my taste. I am really impressed with all their services, the meals were very delicious, the environment was very neat. I really enjoyed the calmness of the hotel, it was wonderful, the room was very comfortable and generally the services were very nice. I enjoyed my stay no doubt. Have nice pictures of Travel House Lekki?